Fall 2018 is upon us. It’s time to collect our favorite fall scented candles, pull out our snuggly sweaters, and decorate our homes for the season. Good news! We have plenty of fall decorating ideas to help you prepare your home for everything from your favorite fall color palette to trendy accent furniture. What are your favorite things about autumn? Today we’re going to cover ideas for wood furniture, table lamps, accessories, and much more. Keep reading to learn about the latest tips and trends for fall interior decorating. As the weather gets cooler, you may find yourself spending more time indoors. From Thanksgiving to Hanukkah, you might gather with friends and family to celebrate holidays and time together. This fall, you need a dining room table that’s equipped for you and all your loved ones to share meals and special occasions. At American Freight Furniture and Mattress, we have a quality selection of dining table sets to choose from. The Jax 5 Piece Dining Set is a top pick for formal dining sets this season. It features a large rectangular farmhouse style table with a solid raw wood grain. The table has a simple structure with ladder style legs and a uniform brown color. The chairs in this set have white upholstery and nailhead trim. The nailhead detailing is rustic and matches the dining table. In the standard set, the 5 pieces include the kitchen table and 4 chairs. The 6 piece set includes the dining table, 4 chairs, and 1 upholstered bench. The 7 piece set includes the table and 6 chairs. Visit your local American Freight to learn how you can customize the Jax dining set. 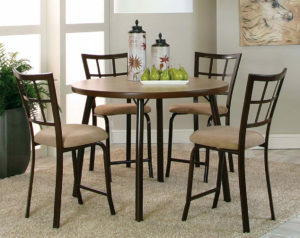 Display all your favorite fall centerpieces on the Jax 5 Piece Dining Set. There are many ways to get creative with formal dining table decorations. Wrap leafy wreaths around tall candle arrangements. Add assortments of flowers and pumpkins to the table. We love to incorporate burnt orange, brown, yellow, and scarlet hues with pieces from nature. Real or faux pinecones, flowers, pumpkins, and leaves are some of our favorite materials to use. If you’re in the market for a compact dining set, the Vision 5 Piece Pub Set could be a match for you. The counter height pub set features a round table with four legs. The legs of the table are a chocolate brown steel and the laminate table top is a lighter brown than the legs. The set includes four chairs. Each chair has a beige upholstered seat and laminate and steel legs. This pub set has all the appeal of wood furniture without the maintenance. It will easily fit in an eat-in kitchen or dining room. We love the Vision 5 Piece Pub Set because of the simplicity of the set. It’s a beautiful pub set on its own and you can easily dress it up. You can make a lot out of a small counter height pub set like the Vision 5 Piece Pub Set. Some of our top fall decorating ideas for compact dining table sets are napkins and placemats. Mix and match patterns and solids to create a festive design. We like to stack colorful folded napkins and retro plates on top of trendy placemats. Your living room is the heart of entertainment space in your home. Prep for this fall with living room furniture that reflects your style and can accompany your family and guests. American Freight Furniture and Mattress offers discount sofas and loveseats. We also have spacious sectionals for seating several people comfortably. Use your living room to host guests for game day watch parties and other weekend gatherings. Or after you’ve shared a meal with friends or family, sit in your living room to keep the party going. Hosting duties aside, we also have great furniture for curling up to watch TV all season long. Click here to read about some of our favorite cozy recliners. Sprawl out in comfort on the Heritage Gray Sofa and Loveseat. This set gives sofas and loveseats a good name. The oversized shape features firm cushions. The set is gray with multicolored throw pillows. The back support of each piece features reversible pillows. We love reversible cushions because they’re easy to clean and plump for couch longevity. Read more about how to prolong the life of your couch with cushion maintenance here. The Heritage Gray Sofa and Loveseat is a great complete living room set. The simple light gray color is so easy to blend with any room. We love to add red or orange pillows and throw blankets to incorporate a fall color palette. Speaking of beautiful fall colors, did you know Sherwin-Williams recently released news of the 2019 Color of the Year? Get ahead of the interior trends by incorporating Cavern Clay into your fall color palette. Cavern Clay is a desert-inspired terracotta shade. Read more about it here. We’re seeing this color paired with gray and white living room sets, so we know it will look incredible with the Heritage Gray Sofa and Loveseat and other gray discount sofas. Stop into your local American Freight Furniture and Mattress to bring home a set of your own today! Ask how you can take it home for just $50. Sofas and loveseats are a match made in heaven. The Camino Caviar Sofa and Loveseat set is no exception. One of our favorite fall decorating ideas is to choose a living room furniture color that blends well with autumn colors. You can’t go wrong with a deep charcoal or black set! The Camino Caviar Sofa and Loveseat is a black modern set. The two back pillows on each piece are reversible for easy fluffing and cleaning. The arms are a simple, thin, and square shape. The sofa legs are a rich dark brown and elevate the set several inches off the ground. The set comes with four contrasting white pillows with various types of simple black script. Soften up your living room during fall and every other season by switching your drapes. We recommend pairing the rich black Camino Caviar Sofa and Loveseat with a soft, sheer curtain. In autumn, choose a rich plum or burnt orange to prep your home for Halloween and Thanksgiving decorations. Drapes are a simple and elegant way to incorporate any season or occasion into your room. Sometimes it’s the little things that make a big statement. We love multipurpose accent furniture for fall. Check out our breakdown of the perfect accent chairs, coffee and end table sets, and recliners for fall. If you’re on the hunt for a spooktacular seat for one, don’t miss the Kiser Black Rocker Recliner. 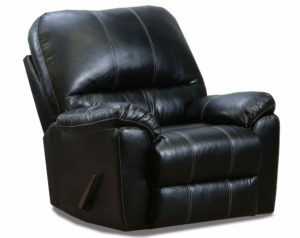 This manual synthetic leather recliner makes simple look sleek. It has an all-black finish and oversized shape for superb comfort. You’re not going to want to sit anywhere else this autumn. Recliners are one of the best fall accent pieces. Not only are they perfect for curling up with a mug of hot chocolate, but they’re also exceptionally stylish and versatile. No matter what color, material, or shape you choose, you can’t go wrong with adding a recliner to your living room. Read about three of our favorite recliners here. 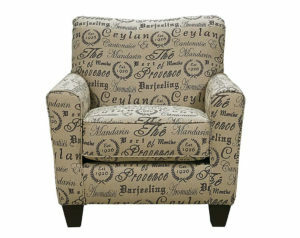 A close second to the trusty recliner is the ingenious accent chair. From armless to oversized, there are so many ways to customize your space for fall with a cute accent chair. We love the Tea House Accent Chair for fall. The offwhite color and script writing are charming. This chair would look incredible as a statement piece in any living room. 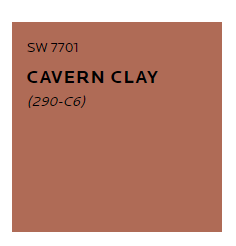 Plus, the 2019 Color of the Year, Cavern Clay, would pair nicely with the accent furniture in a throw blanket or decorative pillow. Fall candles can prep any room of your home for the season in just seconds. From warm scents like pumpkin and maple to musty aromas like firewood, candles are among our favorite fall decorating ideas. We love to place fall candles on coffee tables, end tables, and mantles. Add them to decorative candle holders or stage them on top of fire retardant plates or trays. Even if you don’t light your candles, they add a beautiful pop of color to any space. Complete your living room, office, or bedroom with accessories that look and function great. We’re not just talking cute tabletop decor. Fall accessories can be pieces you buy now and utilize all year long! 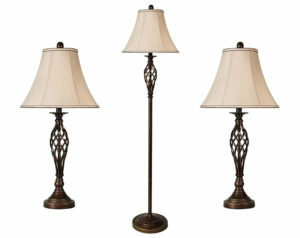 You need a beautiful lamp set to add ample lighting to your living room. The Barclay Brass Cage 3 Lamp Multi-Pack has a beautiful rustic finish. The set comes with a single floor lamp and two table lamps. Each lamp features an intricate spiral cage and a rounded base. Add this lamp set to your living room to light up space when nighttime falls and things get spooky. Choose the Barclay Brass Cage 3 Lamp Multi-Pack to accent your furniture and incorporate a fall-inspired look. For more details about our other favorite floor lamps, click here. 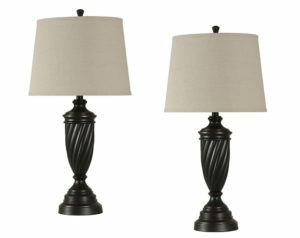 If you don’t like floor lamps, choose a set of two chic black table lamps to illuminate your home. The Bronze Twist 2 Table Lamp Multi-Pack are black and modern. The entire base of the lamps is a carved spiral with tiered detailing. We love this set because it’s a rich black color that’s easy to incorporate into your living room. Complete your living room, family room, or den for fall with an entertainment console that will display your TV and video games. The Espresso 2 Door Media Stand is among our favorite entertainment centers. Store all your spooky Blu-ray and DVD discs in one place that’s easy to use. 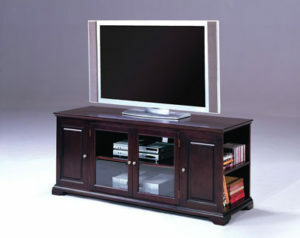 The glass doors open easily and the center shelf is adjustable to accommodate all your electronics. The sides of the console are the perfect place to store discs and extra electronic equipment. Go the extra mile and stage cute fall accessories like pumpkins, leaves, corn stalks, Halloween decorations, and Thanksgiving decorations around your home. Add pumpkins next to your table lamps on top of accent furniture like side tables. Hang leave and twig wreaths around the house. Display corn stalks on your front porch with a stack of hay and a couple of scarecrows. There are so many ways to get inspired for fall decorating ideas. Visit your local American Freight Furniture and Mattress to browse our selection of fall-inspired furniture. We offer discount sofas, dining table sets, table lamps, wood furniture, entertainment centers, accent furniture, and so much more. Did you know we offer low easy payments for just $50? Plus, we offer same-day delivery for all in-stock items AND affordable layaway options. There are so many ways to save at American Freight Furniture and Mattress. Stop in today to learn more.